Play SmartGames anywhere, anytime, no opponent needed. Although SmartGames are designed to play alone, it's also great fun to solve these brain-teasing challenges together. Have fun exercising your brain! Utilize skills ranging from spatial insight to pattern recognition, while improving your problem solving abilities and your memory. Each SmartGame is carefully designed and produced using quality materials that last. And with so many included challenges, each game can be replayed over and over again. 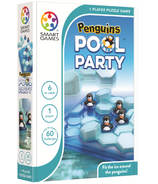 There are SmartGames for children as young as age 3, but many games appeal to teens and adults as well. The multi-level challenges provide loads of fun for everyone from novices to puzzle pros.